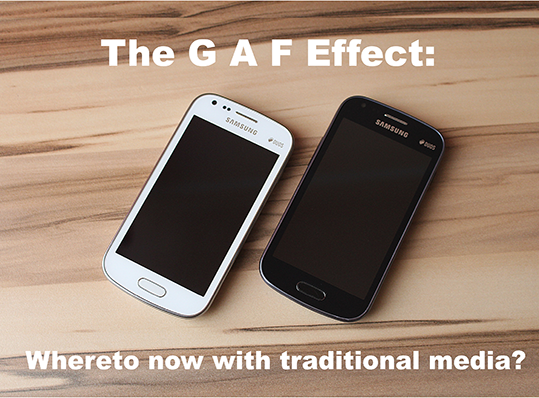 Traditional media, the “GAF” effect, whereto now? A client and I refer to something that happened sometime time ago, had a swag of technical brochures he wanted to label as his company’s for release in the local market. He pretty much used the overseas material an just wanted to change the signature section to include his firm’s logo and contact details. After all the work was done, I thought to myself, “Wow, this will be what will happen to printed brochures in the future!” And, this is pretty much the norm today. We haven’t done much printing work in the recent past, but brochures as PDFs is still ongoing. So, the question is, where to now for print? And, while we are at it, where to now for traditional print media, even the electronic media like television? I’ll get to the this later. Recently, I read an article about the “GAF” effect. GAF here refers to Google, Amazon and Facebook. We refer to their influence and their effect on print, traditional media and really business models which are evolving. Marcomms now has a new face! No longer do they switch on the radio or tv for the news, but their smartphones. They don’t even turn on their desktops or laptops, but their smartphones for messages, email and so on. This means that if an advertisement in say Facebook comes up, the smartphone user just clicks on it and get information on this straight away. If a friend sends that person a message on a product he/she tried, which he/she thought highly of, that message can have a link to the company’s website. If it didn’t, the user would highlight the product or trade name, cut and paste this into a search engine (most probably Google) and get information on the suggested product straight away. Then, of course, he could order the product online and so the process goes. No longer does he/she get information the traditional way like going to a store, getting a brochure, or what not. Everything is done online and this includes ordering the product concerned. In the B2B sphere, it really is pretty much something that proceeds on similar lines. While more information will involve maybe downloading a PDF brochure on the product, or emailing him/herself a link to his/her work computer for further study when he/she got into the office. Hmmm, sound familiar? Well, let’s face it, this is the paradigm of the way the consumer or B2B prospect of today operates. Your marketing communications to your prospect has to allow for the GAF effect, as well. Question is, are you ready for this? Have allowed for this way of life, or way of doing business? If so, good for you. If not, you can continue oblivious of what’s happening today. If you do that though, you do it at your own peril.